Our mantra "just one more break" pushed us through the jungle hike up Mount Inthanon towards Wat Doi Suthep. In all honesty, we were not in the best cardio shape, but as young explorers, we were going to make it to the top. As you hike, you will stumble upon is Wat Pha Lat, a 635-year-old temple nestled away in a verdant jungle garden. Its only neighbor is a gentle waterfall that cascades down upon sheaths of rocks and pothos vines. Wat Pha Lat has moss covering every statue, crumbling ruins, running water, and a hidden pagoda. Everything you imagine a secluded jungle temple to be. Continue to ascend to Wat Doi Suthep from the back left (along the river) of Wat Pha Lat. Climb along the waterfall up to the road, cross, and begin the muddy staircase to the temple. The climb is steep, but Doi Suthep's sheer golden opulence and vast views of clouds blanketed above Chiang Mai make the monk’s trail a bucket list item for every avid hiker. When you look on Google maps, the trailhead is clearly marked, but getting there is another story. You must order a taxi or Grabcar to take you to the end of Suthep Road. From there hike up to the trailhead. Finding the trailhead can be difficult, you will need to step through a barbed wire fence. After the fence its a clear hike to the beginning. We highly suggest having Google maps to guide you. We walked uphill to the trail for about 15 minutes and almost got lost. The hike is a 2.2-mile one way trip with a total of 2,230-feet of elevation gain. The first section of the monk's trail is an easy to moderate 1-mile hike and gains 1,000 feet in elevation. The trail starts rocky, so be prepared with shoes with solid traction. I wore my minimalist Xero sandals, and Demeris wore her Tevas since that's what we had, but trail runners would have been more comfortable. Pieces of orange monk robe mark the trail to Wat Pha Lat. The robes are tied around tree trunks and branches to lead you along. Follow the ties to the temple, and you're sure to make it. At one section, there were monk's robes in two different directions. We took the more difficult path uphill which led to a stream, but it was the wrong way. When you hike the trail take the easy path if you encounter more than one possible route! After about 30-45 minutes of hiking, you will finally see a sign that says "Coffee & Tea" and you know you've made it to Wat Pha Lat. The temple is quiet. Tourists easily miss this secret jungle gem. Wat Pha Lat was originally constructed to allow monk’s to rest and meditate before continuing to Wat Doi Suthep. Follow in their footsteps-sit, eat a snack, take pictures, and enjoy the peace and quiet away from crowds. After taking some photos and having a snack, get ready to take on the second leg of the monk's trail up to Doi Suthep. The path is a challenging uphill hike for 1.2-miles with 1,230-foot elevation gain to the temple. Imagine hiking a muddy Stairmaster, and you have the idea. The trailhead starts in the back left corner of Wat Pha Lat next to the river. Hike up along the waterfall to the main road. Here you can continue on the hike, catch a songthaew to the top or take one to the bottom of the hill. To continue the hike walk across the road and head towards the sign stating "nature trail." We read that this section was a little more difficult than the first, but we will tell you from first-hand experience that it is 100 times more strenuous. From here it only gets 100 times more strenuous. The path is at least a 45-degree angle heading to the top the rest of the way. Most hikes will have tons of switchbacks to decrease the gradient over a longer stretch, but this hike felt that it went straight up to the top. We took five, five-minute breaks. All together it was about an hour and a half ascent to Doi Suthep. After hiking a little over an hour, we were so excited to see the trail was ending and we could see the road. The nature trail ends, but you still need to walk along the main road uphill for about 20 minutes to get to the base of Doi Suthep. Once you arrive, then you get the pleasure of walking up 306 steps to the top where you finally get to enjoy the views and temple. The monk’s trail is difficult but the jungle’s beauty and views of Doi Suthep make every sweaty step worth the challenge. Bring bug spray, bug spray, and more bug spray like Sawyer’s with Picaridin. We are not scared of bugs, but no one likes having them crawl over your body. Hiking the jungle, you will encounter more bugs than you ever have. There are tons of mosquitos flying around, mainly since the trail follows streams the entire time. Also, we encountered spiders and tons of ants. We were the first ones on the trail, and we both walked through hundreds of spider webs. Usually, it was strands across the path, but a few times we almost stepped in to complete webs with a spider waiting in the center for prey. We're not sure where all the ants came from, but we had them all over our bodies. At some points, we may have stepped near an anthill, but I believe we got covered when we brushed up against branches and other foliage. I had them all over my pack and kept wiping them off of my neck. We would recommend waiting until you get a dry morning to hike the monk's trail. Rain would turn the trail into a slippery mud slid, best avoided so you won't fall and hurt yourself. Bring lots of water! The trails are long and strenuous. The jungle is hot and steamy. You will sweat a lot. Brenden completely soaked his shirt, pants, and the pack. Make sure to rehydrate as much as you can as you do this strenuous hike. Snacks to keep you energized through the hike are also a must. The path less traveled, though more challenging, is usually the most rewarding. The monk's trail is not your average way to experience Doi Suthep but in our opinion is the best and most adventurous way to journey to the temple. 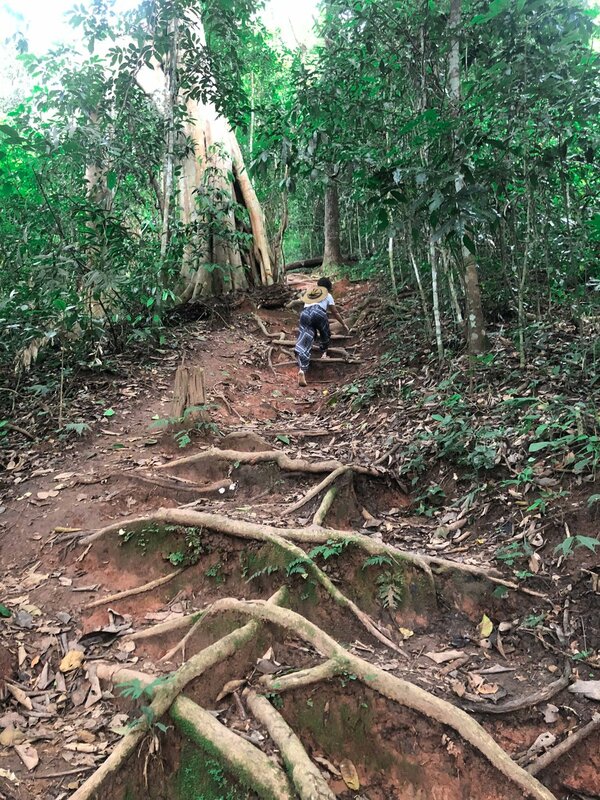 The trail guides you through Mount Inthanon's thick emerald green jungle, steep muddy paths, waterfalls, and wildlife up to Wat Pha Lat and Doi Suthep. The rewards you experience are quiet vine covered temples and vast city views. Every nature lover's dream. 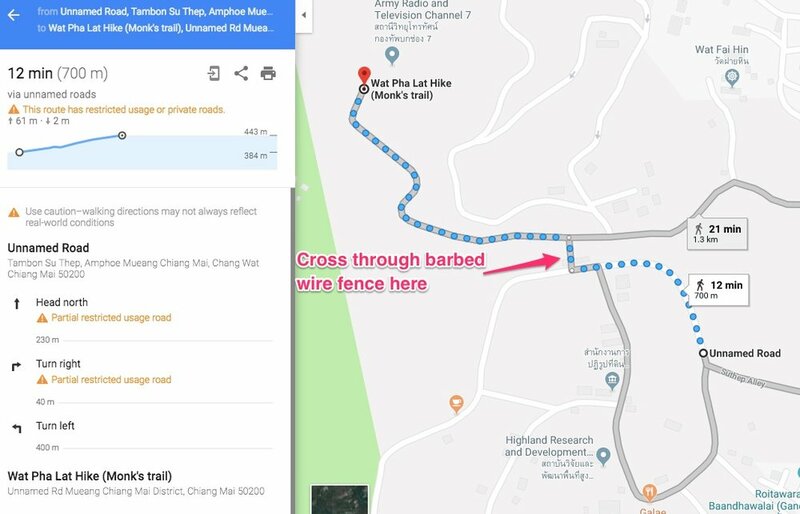 Have any questions about the monk’s trail to Wat Pha Lat and Wat Doi Suthep in Chiang Mai, Thailand? Drop us a comment! Let us know if you have any other trail suggestions in Thailand too. We are all ears!